Get ready to spend a wonderful vacation with your family and friends at Sunset Beach in South Walton County!!! Sunset Beach is located on the eastern end of Scenic 30A by Seacrest Beach and Rosemary Beach. This amazing subdivision is on the south side of 30A and is a gated community with dedicated beach access, that features lovely multi-level homes with incredible Gulf views. 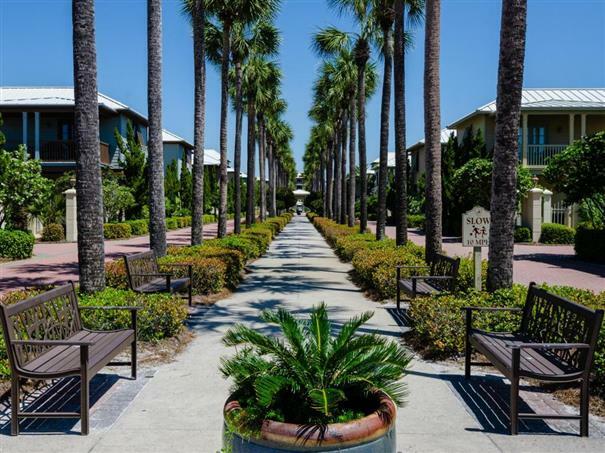 This private resort community of Sunset Beach, features a bricked walkway, lined with Palm trees, that lead to the heated pool that sits high on the dunes, above the gorgeous, white sandy beach on the Gulf of Mexico. With 2 bicycle rental shops nearby, you can ride to the restaurants and shops next door. This is a perfect location to vacation in the Emerald Coast, no matter what the season! Children and adults love to spend time at the beach. The water can seem like bathwater due to how warm it is during various seasons of the year. Families frequently bring beach balls, floaties and sand toys. It is good to note that time and effort has been spent to ensure that the beach and shoreline stays in great condition. When it is time to stretch the legs and do something else, there are plenty of activities to do next to the beach. Some people like to take a bike ride next to the water and watch the waves roll against the shoreline. Walkers enjoy the paths that take them up and down the beach. When it is time to get some exercise and explore more of the area, feel free to visit the local state park, which features wildlife, walking paths, courteous members on staff and so much more. Golf enthusiasts appreciate the beautiful golf course in the area. It can be an ideal place for a couple to spend time together while their children are enjoying the pool or doing other activities. Many families like to visit shops at Rosemary Beach or Village of South Walton. Please take a look at other great homes in the 30A South Walton area.